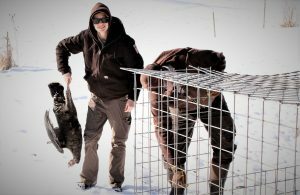 Randall McBride a Depredation Landowner Specialist holds a freshly trapped hen captured in Avon Thursday morning. Jason Robinson, the former Upland Game Program Coordinator for Utah Division of Wildlife Resources, said the wild turkey comeback is one of the greatest success stories of wildlife restoration. Jen O’Leary holds a freshly captured tom turkey while Nick Madsen secures the trap for another wild turkey. The National Turkey Federation has worked hard to restore populations across the country. They started in 1930, and by 1990 they started seeing success. Turkeys are an important part of Utah’s food chain. Turkeys, their poults, and their eggs are sought after by a list of predators. Adult toms can grow up to 20 pounds. The bird is an omnivore; they eat bugs, acorns and leftover berries, and they stir the ground, mixing things up. However, the birds have been causing problems with some homeowners in different parts of the valley. They get into a farmer’s grain and hay, and will steal chicken feed that has been scattered by farmers. Jim Christensen, a DWR biologist, said the animals are very hungry. Nick Madsen and Jen O’Leary, Division of Wildlife Resources technicians, band a tom turkey that was captured in Mendon on Thursday, Feb. 7, 2019. He said the birds will seek refuge on private land and will go back to the forest and do their thing up there when winter is over and they can feed on the wilderness. The bird population has grown to the point in Cache Valley that the DWR is trapping and moving them to the Book Cliffs, in Eastern Utah. They have also been putting collars on the turkeys to track their movements. Nick Madsen, a DWR technician, is the one setting traps and harvesting the birds for shipment. He said they have taken birds from all across the valley. Randall McBride, the DWR Depredation Landowner Specialist, said DWR only gets involved when wildlife has a conflict with the public. 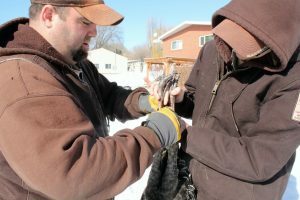 Nick Madsen and Jen O’Leary, Division of Wildlife Resources technicians, finish boxing a captured tom turkey in Mendon on Thursday, Feb. 7, 2019. When it comes to hunting the game birds, DWR has increased the numbers that can be taken during a season. There is both a fall season and a spring season. Both Madsen and McBride hunt and eat the birds. He said there is nothing like a slice of smoked wild turkey on a piece of bread for lunch. I think they should take those nasty birds and put them in the back yard of the genius who thought we needed them in cache valley and let him deal with the disaster they bring. I ThInK tHeY ShOuLd TaKe ThOsE nAsTy BiRdS aNd PuT tHeM iN tHe BaCk YaRd…. I think that the DWR should keep up the good work. Thank you DWR!! If they capture all the turkeys who will run for office?